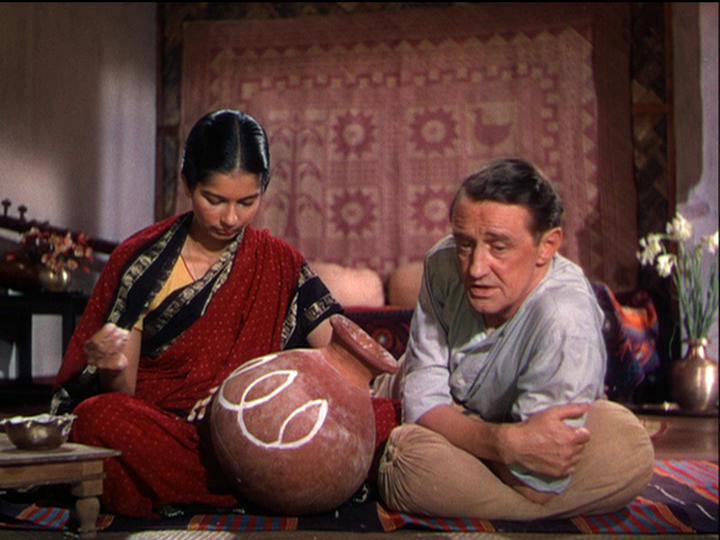 The River: A coming-of-age tale by Jean Renoir, renowned French director of Rules of the Game and Grand Illusion, that moves through its paces without providing the cliches of redemption that plague this archetypal plot. The River is about the beauty and naivety of childhood dreams of romance, the quiet frustration of being stuck on the outside of a culture, and the need to allow life to continue, even when it seems unbearable. 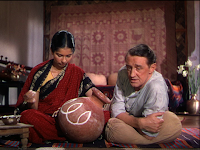 It's a brightly-lit movie of mid-day India, photographed in the shameless colors of youth: on the background of browns and greens, earth and vegetation, it's a vision of reds, oranges, and blues, a culture expressing itself to the eyes of a child. Renoir's setup is simple enough to be effortless, and yet multifaceted enough to be emotionally complex and pluralistic. A little girl named Harriet, an older child in a family of girls living in a British household in India, receives news of the arrival of a soldier named Captain John. Naturally, the family of young girls is smitten with him, and Harriet almost immediately recognizes Valerie, her slightly older cousin, as a romantic rival for the veteran. In their adolescent rivalry, their channel for their own sexual awakening, both Harriet and Valerie fail to notice that Captain John is struggling with conflicts of his own: a sense of aimlessness and alienation in the aftermath of war, and a frustrated romantic interest in Melanie, the half-Indian daughter of his host in India. These issues are not sudden emergent conflicts to be resolved through heroics or revelations. Rather, they are the complications of everyday life, the uncertainties and complexities that only unravel with the patient therapy of time and ritual. That's what Renoir's film is ultimately about: man's ability to accept life's challenges, and in accepting them, to let them gradually resolve themselves. Even the most dramatic moments of the film -- a first kiss and an unexpected death -- don't seem to change the characters' worlds, though they do prompt some drastic reactions. There are lots of stories about the inspiration for The River, mostly focusing on Renoir's collaboration with Rumer Godden, the author of the source novel. Only a few mention the paintings of Jean Renoir's father, noted Impressionist Pierre-Auguste Renoir, but some of the father's paintings could be interpreted as direct source images for the film. 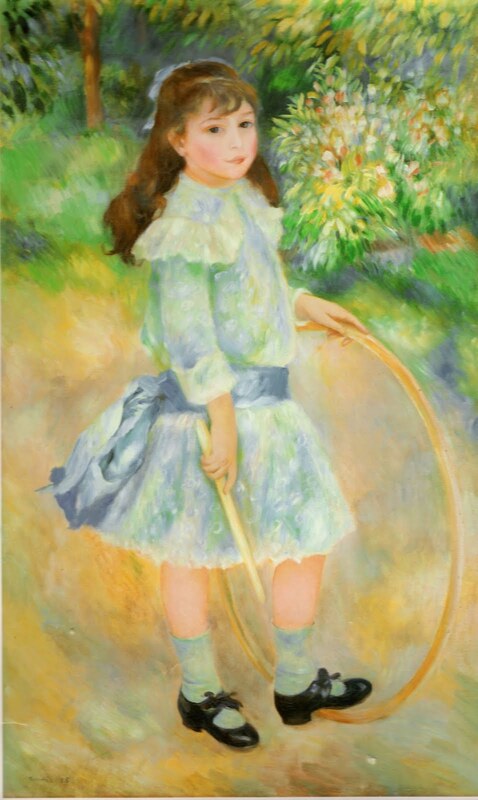 In particular, consider a painting of a little girl in a garden, holding a hoop, or various images of emerald landscapes, gazed upon by society women in porch chairs. The epicenter of Renoir's film is an echo of these pastoral scenes... his India is a sun-drenched landscape of greens and earth-tones, and the moments he captures resonate with the same sensuality as his father's landscapes and feminine figures. Like many filmmakers of this period, shaped by the discipline of black-and-white photography, he was highly conscious of the limitations of three-strip Technicolor, which produced rich, saturated hues. 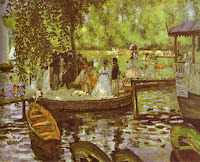 Rather than try to nuance these toward a more subtle palette, Renoir took the view that the filmmaker should set color film only “simple problems.” He thought the tropical vegetation of Bengal ideal, with its “colors neither too vivid nor mixed,” reminding him of the painters Raoul Dufy and Henri Matisse. Renoir and his lighting cameraman (and nephew), Claude Renoir, working with the designer Eugène Lourié, aimed at avoiding all “half-tints,” even going so far as to paint a lawn a more definite shade of green for one scene. Whatever the director's reasons, these strong colors take on their own particular role in the film. Specifically, they become cultural indicators for the icons of Indian and Hindu tradition... the brightest reds and oranges are the chalk dust, the Indian garb, and the flowers and decorations during the Hindu festivals. Blue, though often present, is only brought into the foreground in the skin of Lord Krishna, who is of a living artifact of this culture. The whole mythological system is seen by the young girls (especially Harriet) as a vibrant mystery that holds the keys to the strangeness of life on the banks of the Ganges. It's a mythology that vibrates in these bright, living colors, contrasting severely with the white, brown, neutral and earth-toned European colonial sanctums that comprise Harriet's own native world. The River is cited by Martin Scorsese as one of the two greatest uses of color in film, the other being the (recently discussed) film The Red Shoes (see his whole list of great color films here). These two films make interesting sister pieces, at least in terms of aesthetics: as I mentioned before, the most vibrant colors in The Red Shoes are the colors of darkness, the shadowy interiors of hallways and backstage hiding places. It's a subtle palette, wherein even the signature color, the red of the titular ballet shoes, is generally immersed in shadow. This contrasts sharply with the color treatment of The River, which is a day-lit film about sunlight and vibrant exterior space. As Ebert said in his Great Movies essay, "Although the film covers one year, the impression is of an endless summer day during which the girls play and write in their journals". It's a movie full of splashes of bright color, representing the products of a vibrant culture and religion. Interior versus exterior, shadows versus sunlight, subtlety and nuance versus simplicity and distinction: these are two lessons in visualization, two opposing chromatic worlds, rendered at the genesis of widespread color cinema. Ultimately, though, this use of Technicolor is only the technical and artistic touch upon a subtle, delicately-wrought poetic narrative. It's a film that resists many pitfalls of such sensitive material: cultural paternalism, cliches of exoticism, moralization about its characters' behavior, or the easy solace of resolution to the myriad challenges it offers to the viewer. Like the river of its title, the film flows into its own horizon, willing to redeem itself through repetition and recreation of the conditions of its own existence.